It is embarrassingly tempting to just reach for a boxed or canned meal, I get it. It is simply less effort, and let’s be honest, the kids typically complain about it less. So if you can’t beat them, join them! 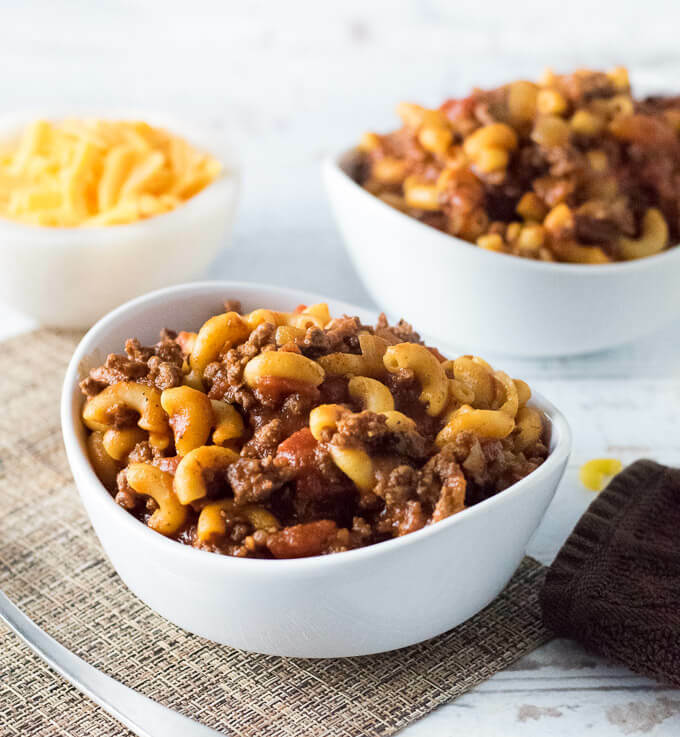 This homemade beefaroni is sure to please your picky eaters, and you will feel good about knowing exactly what ingredients you are feeding them! 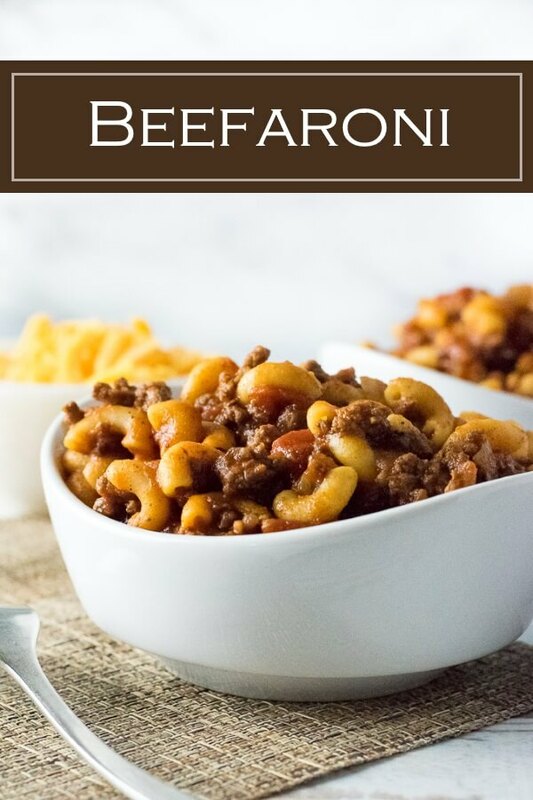 Beefaroni is a popular canned pasta meal enjoyed by kids, and adults with low standards (relax, that is a joke). Beefaroni consists of crumbled ground beef in a lightly seasoned tomato sauce combined with noodles. Though cheap and easy to buy at the store, this dish can easily be replicated at home with fresher ingredients. My recipe sticks to the beefaroni basics of tomato sauce, ground beef, and macaroni noodles. However, I liven it up with diced tomatoes, chopped onion, and a bit of Worcestershire sauce for depth. This easy family dinner comes together in the time it takes to boil water and cook the pasta. Since the crumbled beef will be swallowed up in a sea of tomato sauce, using a leaner beef is a good way to save on calories without sacrificing flavor. Typically, using a fattier beef will lend more flavor and moisture to a dish, such as a classic meatloaf. 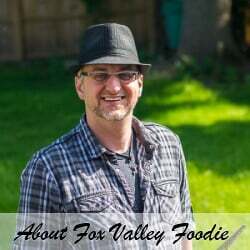 However, in a saucy dish such as beefaroni, you can make it healthier with a leaner ground beef and never know the difference. I use a 90/10 beef for this recipe, however you can go leaner than that if desired. Although, I find if you go TOO lean, the beef doesn’t brown as well because there is too little fat. In my experience, most people don’t brown beef properly. 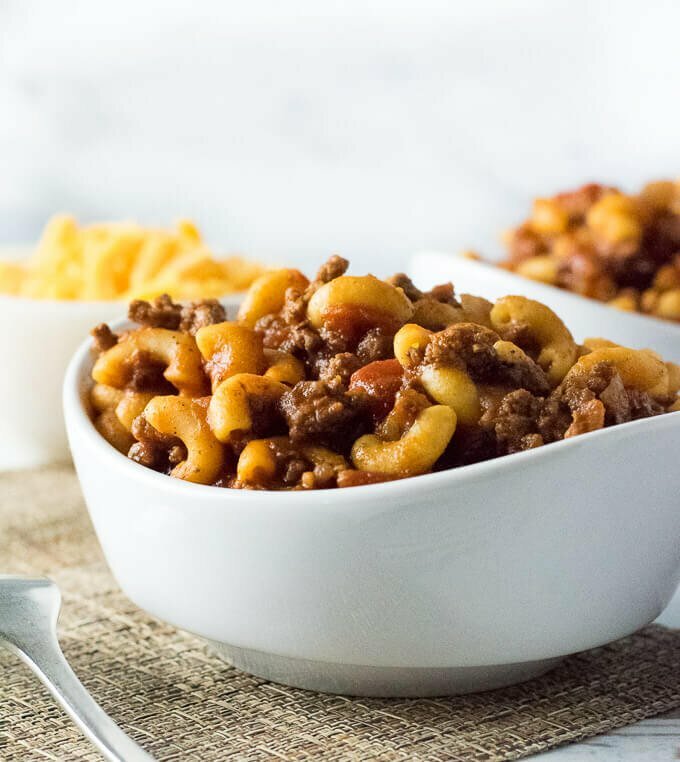 Truly browned beef will add a lot of additional flavor and depth to a dish, which is particularly important in a dish like my beefaroni which has minimal ingredients. Rather than simply cooking the beef until it is a grayish-brown, let the beef sit in the skillet a bit longer without stirring excessively. The ground beef resting on the bottom of the skillet will form a deep brown crust around it. This is where the flavor is at! At this point stir the beef to allow the rest to brown as well. For a fresh gourmet twist, add a few fresh basil leaves to the tomato sauce as it simmers, it will transform the dish! A more simple alternative would be to sprinkle in some dry Italian seasoning, and perhaps a chopped pepper. 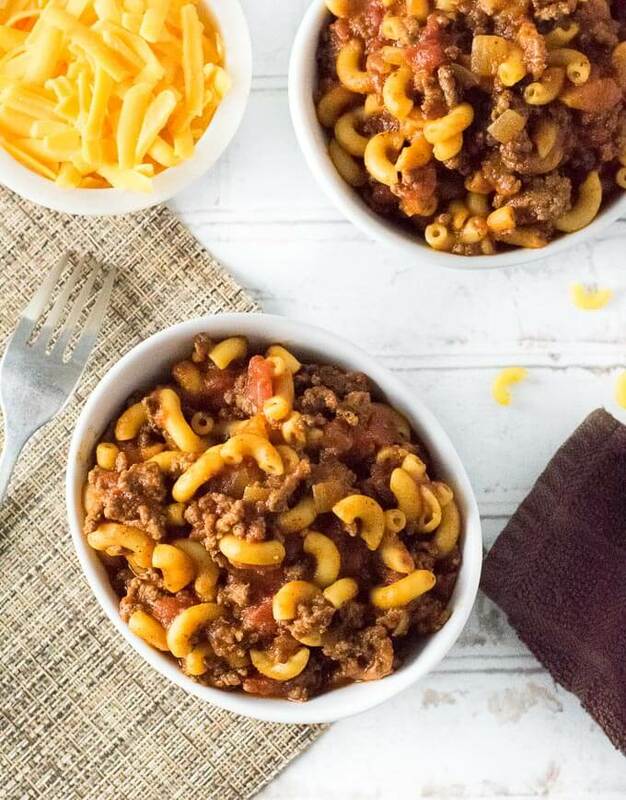 Going in the opposite direction, you can add 1-2 cups of shredded cheddar cheese to create a cheesy pasta dish, similar to chili mac, or chili seasonings to make it a quick chili with noodles. Boil a pot of salted water and add macaroni. Cook according to box instructions. While water comes to a boil, add beef, onions, salt, and pepper to a saute pan set over medium heat. Brown the beef and cook onions until tender. Add minced garlic and cook an additional couple of minutes until garlic is fragrant. Add canned tomato sauce, drained diced tomatoes, and Worcestershire sauce. Stir everything together and let simmer 10-15 minutes. Once macaroni is tender, drain from water and add to the skillet with the tomato sauce. Mix together and serve. 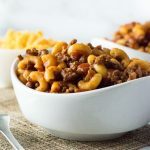 IF YOU LIKED THIS RECIPE you will also love my Homemade Hamburger Helper! Be sure to try my Homemade Sloppy Joes as well! I love the fact that your recipes are made from scratch .